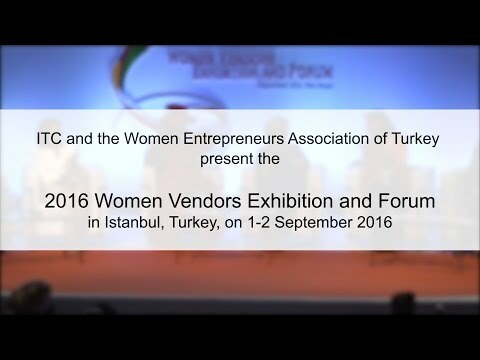 The Women Vendors Exhibition and Forum (WVEF), organized by the International Trade Centre (ITC) and KAGIDER, took place on 23-24 February 2017 in Istanbul, Turkey. WVEF 2017 attracted more than 360 participants from Europe, Africa, Asia and Latin America, who had business meetings with representatives from more than 50 buying companies, including Mercedes-Benz Turkey, Deloitte, Garanti Bank, Boyner Holding, General Electric, Allianz Turkey, Danone / Nutricia Early Life Nutrition, Procter&Gamble and Microsoft Turkey. Many notable achievements emerged from the event including over 1000 bilateral meetings that lead to up to US$ 10 million worth of business opportunity. The two-day event featured a series of inspirational sessions covering issues such financing, attracting investors, contract negotiations and how to use data in decision-making. WVEF 2017 edition introduced SheTrades interactive area with partners such as AXA Insurance, Deloite, Garanti Bank, IFC, Sidley Austin providing pocket trainings to WVEF participants in order to drive new alliances, strengthen learning, sharing and networking. One of the highlights of the SheTrades interactive area was the launch of our first WVEF Investment Challenge won by a Kenyan women entrepreneur “Skylon Global” who presented in front of a panel of judges composed of IFC and angel investors an investment pitch on an app that will connect people more easily to healthcare providers. At the closing ceremony, ITC announced that moving forward, WVEF would now be known as SheTrades Global to further align the event to ITC’s SheTrades initiative and highlight the importance of helping women to trade across borders. Since its launch in 2015 the SheTrades initiative has received commitments from governments, trade support institutions and the private sector to connect 800,000 women to markets.